HBO’s “Paterno” opens with its eponymous character, former Penn State football coach Joe Paterno (Al Pacino), earning his record 409th collegiate football victory. If coaches typically stalk the sidelines, however, Paterno wound up coaching in the a skybox that day due to a pelvic injury, a fact the movie honors and which inadvertently makes for a stirring visual, evoking a king viewing his fiefdom from on high. That fiefdom is expressed by director Barry Levinson blending images of Paterno and his assistant coaches on the sideline conferring with (yelling at) players with raucous fans in the stands, TV production people behind the scenes beaming the entire spectacle across the continent, and school administrators conferring in a stadium hallway. It is a sequence summarizing college football’s cacophonous, far-reaching nature, suggesting it is so much more than what happens on the field. That, of course, is what led to Paterno’s kingdom crumbling despite his record number of wins, when in late 2011 former Penn State defensive coordinator Jerry Sandusky was indicted on multiple accounts of child abuse. In the aftermath, questions emerged of how much Joe Paterno knew and when he knew it, though in the rush to get those answers and in the subsequent fall of both Paterno and the program he had built, the heinous nature of Sandusky’s crimes and his myriad victims too often became clouded over. And if you wish the pain inflicted on the victims might have been lingered over more, Levinson does not ignore those affected, spotlighting Aaron Fisher (Ben Cook), Victim One. We don’t really get to know him, but we do see what he goes through, a bout of bullying at school communicating what was risked by coming forward in a place where the football coach was deity that could do no wrong. We meet Fisher through Sara Ganim (Riley Keough), the reporter who broke the story for Harrisburg’s Patriot-News. Keough is convincing in her air of being both sort of overwhelmed by the scope of the story but also hyper-focused on getting it right. Her storyline suggests “Spotlight”, but there is little on-the-ground reporting shown, more just expository scenes in the office with her editor. Even so, what comes through is the idea that this information was just sort of lying out in the open with no one acting. She did not stand by; she seized on it. Levinson relegates Sandusky entirely to the movie’s periphery, punting on the notion of why this monster did what he did, as if Levinson either suspected the audience would not be able to take it or because Levinson decided he could not take it himself. 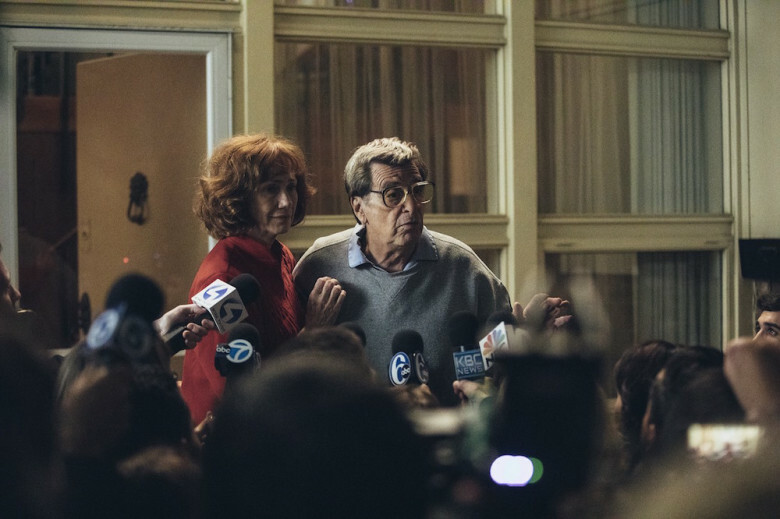 “Paterno” also struggles to show why no one did anything, limiting the conspiracy of inaction among high-ranking Penn State officials to clumsily shot flashbacks that betray the movie’s TV origins. In theory this inaction ties back to the community, but the community’s rendering is “Paterno’s” most egregious failing. I’m not sure if this was due to budget constrictions, but we see no towering shot of the 109,000 football seat stadium or wide frames of the campus and its students to see all that has been brought to bear in Paterno’s name. All we see are a few kids at some party Ganim attends and a few non-descript tight shots of angry students at a bar and on the street. What causes the community to unite in defiance when Paterno is canned never becomes clear, just sort of presumed, as if everyone already had the basic outline entering the movie. For as little time as we spend in the community, we spend a lot of time inside the Paterno home, which is where the movie shines. A scene in which the Paterno family resorts to Googling to find a crisis manager emblemizes how they are so insulated within their castle walls that they are ill-equipped to manage such a volatile situation. And no one, we realize, is more ill-equipped than Paterno himself, a fact connected both to his age and his obsession. If a series of soppy, made-for-TV-ish flashbacks are meant to gradually evince how Coach Paterno did have the facts in front of him the whole time, Pacino’s performance away from these narrative embellishments is proof enough of Paterno’s negligence, willful or otherwise. If occasionally, when his voice rises, Pacino sounds like Pacino, he mostly buries himself in the part, evincing an eternally distracted man unable to wrap his mind around what is happening. The movie’s most disturbingly affecting scenes find Paterno at home as his family squabbles, stranded on the edge, hearing but not listening, which, in close-ups, allows Pacino to make a feast of confused, wandering eyes. Cruelly, he can’t grasp what the fuss is all about, not with another game looming. stick to sports. Can’t I, you sense him thinking, just stick to sports?